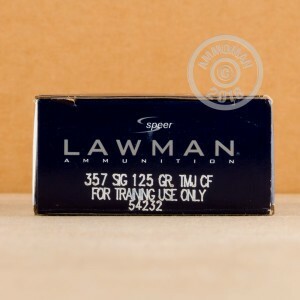 Speer Lawman CleanFire ammunition is well suited for indoor ranges where ventilation is usually less than ideal. 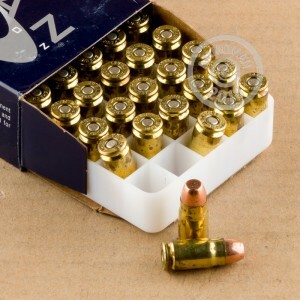 Each cartridge in this box of 50 fires a 125 grain bullet at a muzzle velocity of 1,350 feet per second. CleanFire ammo features non-corrosive lead and antimony free primers and total metal jacket (TMJ) bullets with fully encapsulated cores. This results in a significant reduction in the amount of heavy metals released into the air when the round is fired. Speer ammunition is loaded in Lewiston, Idaho and uses reloadable brass casings. Great Ammo for a great price.! This Anmo is underrated for some reason by gun snobs. I use both Sig 357 and SW 40. Never an issue in my M&P.